At first glance, professional tennis and NASCAR would appear to have little in common. Tennis is graceful skill, combined with occasional power. The other features speed and crashing metal. That said, the two sports share one commonality. Each displays one of its showcase events very early in the season. NASCAR opens with the Daytona 500, otherwise known as Stock Car’s Super Bowl. 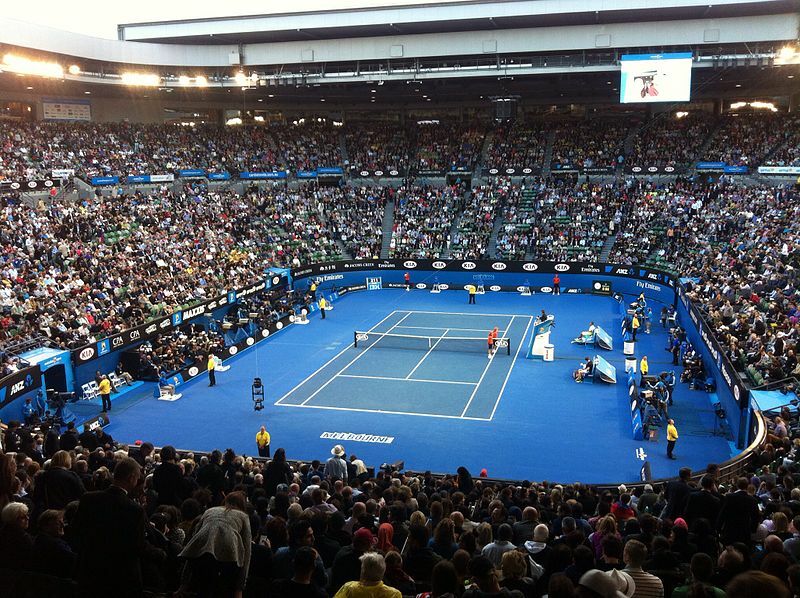 The tennis world begins the new season with its eyes focused on Melbourne, Australia. The Australian Open finished its two-week run this weekend. Novak Djokovic and Naomi Osaka stood atop the tennis world at its Down Under lid-lifter of the tennis season. That Novak Djokovic stands tall as the reigning Australian Open champion should come as a surprise to no one. His 2019 win marks his record-setting seventh Australian Open championship and his first since back-to-back wins in 2015-16. This is the powerful Serbs’ sixth Australian Open title this decade! Novak Djokovic celebrates his 2019 Australia Open title, garnered with an impressive win over Rafael Nadal. How did Djokovic do it? While major championships are never won “easily,” the road to the 2019 title wasn’t as fraught with pitfalls as some. Djokovic was never challenged in the final three rounds, including Kei Nishikori retirement due to injury in the quarters. Djokovic never endured a five-set match and was only taken to four sets by Denis Shapovalov in the third round and Daniil Medvedev in the fourth. The men’s finals was a much-anticipated renewed battle between Djokovic and Rafael Nadal, but the veteran Nadal was able to put up little resistance. In the end, Djokovic triumphed 6-3, 6-2, 6-3. How did Osaka do it? Naomi Osaka’s trip to the finals was a bit more harrowing. Ms. Osaka prevailed through five consecutive three-set matches, including a fourth-round nail biter against Anastasija Sevastova, who won 13 games in the three-set match. The finals matchup between Osaka and Petra Kvitova may not have had the incandescent star-power of the Djokovic-Nadal matchup, but the women’s final was far more exciting than the men’s matchup turned out to be. In the end, Osaka outlasted Kvitova, 7-6, 5-7, 6-4. With the victory, Osaka will take over the world Number One WTA ranking. It marks the first time that a female tennis player of Asian descent will achieve that lofty perch. In news from further down the 2019 Australian Open board, Nicolas Mahut and Pierre-Hugues Herbert achieved the career men’s doubles Grand Slam. They defeated Henri Kontinen and John Peers in the final, 6–4, 7–6 (7–1). Mate’ Pavic and Oliver Marach gamely defended their 2018 title. Ultimately, they lost to Nicolás Jarry and Máximo González in the second round. On the women’s half of the doubles’ draw, Zhang Shuai and Samantha Stosur bested defending champs Kristina Mladenovic and Tímea Babos 6–3, 6–4. In doubles’ news, Czech Kateřina Siniaková retained her WTA Number One doubles ranking by reaching the Australian Open third round with partner Barbora Krejčíková. Barbora Strýcová contended for the top ranking at when the start tournament began, but fell short, at least for now. The doubles’ rankings are pretty fluid right now, and the lead may change more than once before the 2019 WTA tennis season draws its final breath next autumn. The casual tennis fans’ eyes turn now to the Wimbledon fortnight, this summer in London. Watch Gildshire for analysis of the event, but until then, there is much tennis to played. Be inspired by the matches, but don’t pull a hammie jumping over the net.